How to Delete Everything from iPhone 5 & Wipe It Clean? 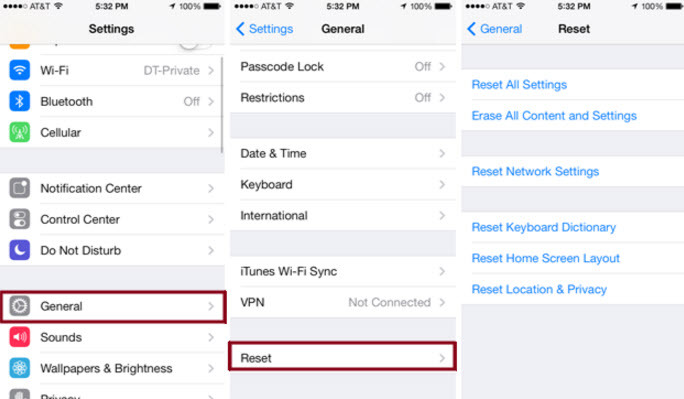 How to Delete Everything from iPhone 5? If you use an iPhone 5, there are many reasons due to which you’d like to delete all the data from your device. For example, if you want to sell the device to someone, to make sure that no one else gets to access your personal data, you’d better erase all data. Or you might want to delete data from your device because it is not working as smoothly as it used to in the past. A lot of users also prefer deleting everything from their device when they have virus in their device. No matter what the reason to delete everything from an iPhone 5 is, how will you actually do it? There are generally two methods which people use to do it. Step 1: Open iTunes in your Mac or Windows computer. Step 2: Check the list of available device and choose your device. Step 3: Now, click on Restore button in the Summary tab. 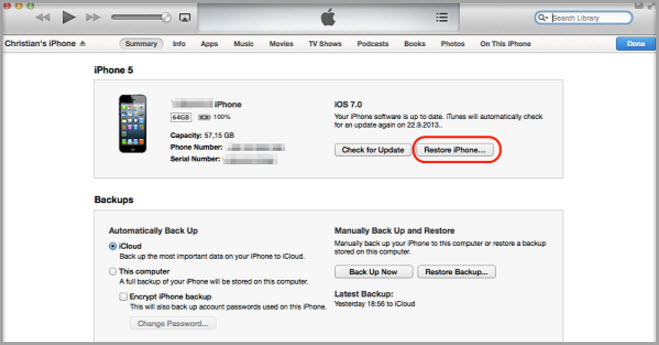 Step 4:A pop-up will ask you to confirm your choice and when you confirm your choice by clicking on Restore, iTunes will start erasing all the data from your iPhone. Step 1: Tap on Settings and select General. Step 2: In General, start scrolling down and look for Reset. Step 3: Tap on Reset and a new screen with many different options for deleting data will be available. Step 4: Look for Erase All Content and Settings button and select it. Step 5: A pop-up warning will appear to confirm you choice. Select it and all the data from your device will be deleted. While these 2 methods are very commonly used, it has got a number of drawbacks too. For instance, you do not get the right to choose the data that you want to delete from your iPhone. If there are a few files that you want to keep, you will have to look for another method as this method will delete everything from your device. Moreover, there have been instances where the users were unable to activate their mobile after erasing all their data. Also, many experts suggest that deleting all the data from your iPhone every now and then damages the RAM and battery life of the device. However, there is a safer and simpler solution to erase everything on iPhone 5 - iMyFone Umate Pro or iMyFone Umate Pro for Mac. The software provides you with many different options to manage the storage in your iPhone. You can erase all the data from your iPhone or can also delete parts of it almost instantly. 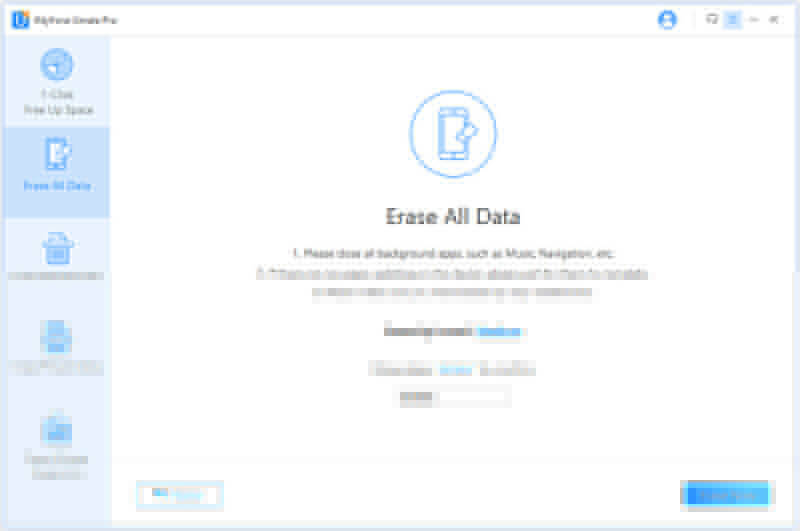 Erase All Data: With the help of this feature, users can easily delete everything from their iPhone 5 without worrying about any of the negative consequences that are related to other methods. Moreover, the data deleted by this software cannot be recovered and it doesn’t even require you to activate the device again, while data deleted from Setting can still be recovered with some restore tools, so to avoid the privacy leak, Umate Pro is a better solution. Erase Deleted Files: When you delete data from your iPhone, majority of the times it can be easily recovered with special software. If you have deleted files from your iPhone 5, you can use the Erase Deleted Files option of this software to make sure that the files can never be recovered. 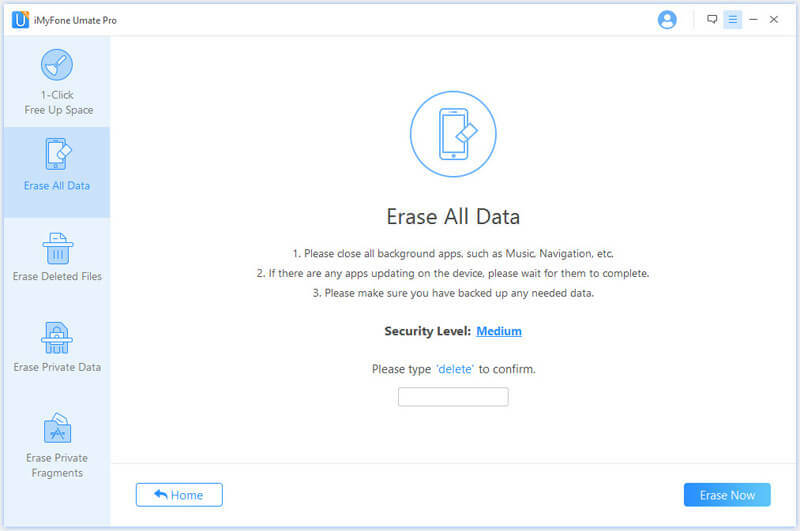 Erase Private Data: If you have your personal contacts, photos, messages, browsing history or other private files that you don’t want anyone else to have access to, use the Erase Private Data feature of this software and the data will be safely deleted from your iPhone 5. 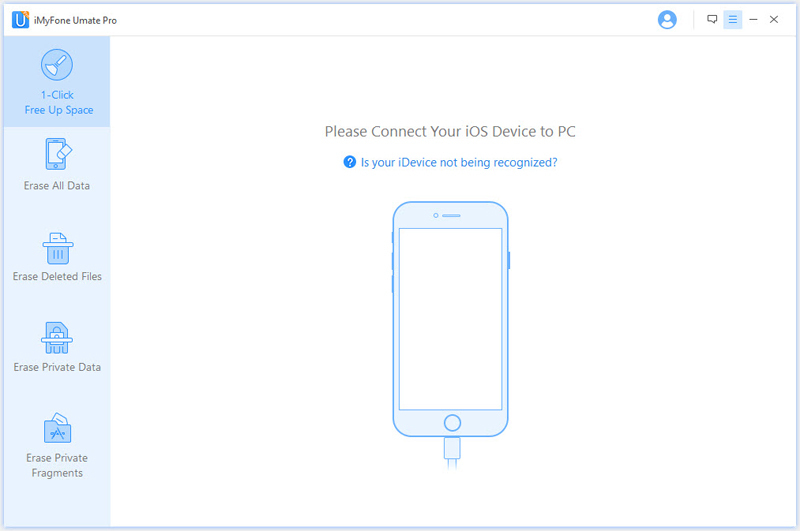 Step 1: After downloading iMyFone Umate Pro, connect your iPhone 5 to your computer. Step 2: On the interface, look for Erase All Data tab, click on it and then select Erase. Step 3: Manually type the word “delete” and select Erase Now for allowing the software to start erasing all the data from your iPhone 5. As compared to directly erasing data from iPhone or from iTunes, iMyFone Umate Pro is a much better solution that provides you with a number of advantages. Moreover, while you need to purchase the full version, trial version can be downloaded for free for Windows and Mac computers. So, download the software to manage the storage of your iPhone 5 and erase your iPhone data for privacy protection in a simple and secure manner.